A Craft Cocktail Blog for the Home Bartender that Focuses on Original Creations Drawn from Culinary Inspiration. They also have a Negroni on draft, and it is carbonated, or mixed with seltzer water, it’s hard to tell. It was watery and disappointing. I’d rather have a glass of gummy bears. The reason you patronize this bar is the divey atmosphere, and the (relatively) cheap shots of Fernet. Ask for a slice of lime and squeeze it into the glass, to add a little complexity. When I most recently visited this bar with my friends (yes, I have friends), a question came up as to the exact pronunciation of the word “Fernet”. In the back of my head I knew it was an Italian product, but it really looks like it wants to be said “Fer-nay”, as if it were French, and that is how I have always pronounced it. The bartendress who poured it for me referred to it as “Fer-NET”, and this forced me to reconsider my prior conviction. I looked it up on Wikipedia and sure enough, the ‘t’ is not silent. 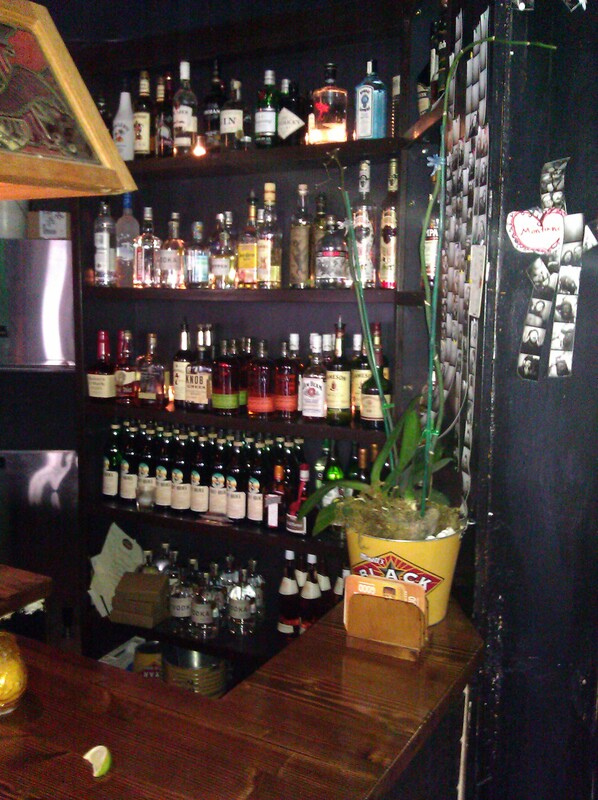 As I look at the photo above, I notice they also have some Bulleit. Usually when I’m in a bar that has no chance of producing a proper drink, I like to order rye and tonic with a dash of bitters. If they give you an equal proportions pour, it’s a rewarding libation. You might even find yourself making it at home, once in a while. I guess this place is trying to appeal to the cocktail hipster crowd, but in order to be a proper dive bar, the drinks can’t be too good. Categories: excursions | Tags: bars, booze, dive bar, drinking, drinks, excursion, fernet, fernet on tap, mixed drinks, seattle, seattle bars | Permalink.